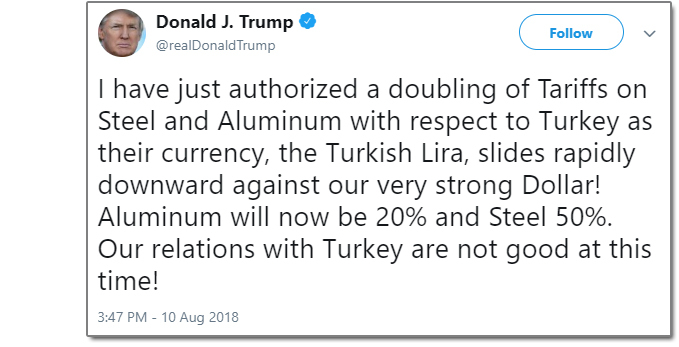 The hurt that US President Trump laid on Turkey on Aug. 10 was feather-light – a doubling of tariffs on imported Turkish steel and aluminium. Turkey sells only about USD 1.4 billion in primary metals to the USA in an average year, according to the US Commerce Dept. So, the new levies will reduce Turkey’s GDP by just about 0.04%. And that’s assuming Turkish mills and smelters have to cut prices by 25% to retain their American customers – the hit will be even less if the Turks find customers in other nations that aren’t jamming it with high tariffs. So why did a 0.04% slap on the wrist – more of a tap, really – cause the Turkish lira to plummet; prompt Turkish President Erdogan to complain of “economic warfare”; push down the currencies of Argentina, India, Indonesia, Mexico, Russia, South Africa, and Zambia; and raise Italy’s borrowing costs to their highest vs. Germany’s since May? It’s simple, actually. Conditions for a crisis are ripe. Financial weakness and poor policies in Turkey and other vulnerable nations supplied dry tinder. Two headstrong characters butting heads like flint and steel, provided the spark. Are we on the brink of another global financial crisis?